I also love genealogy, and I'm very proud of my heritage. From my Scotland-born grandparents and greatgrandparents, to the Dutch-Mennonites who were chased out of Russia in a covered wagon while being shot at by the red army, to my Danish great grandfather who left his sweetheart in Europe when he came to Canada and she followed him here (Although I'm not 100 percent sure of that last story...I'll have to call up my great aunts to clarify). Memory of Francis Gafs Hufband to Jannet Slimmon who died in Bufh Jan 12 1786 aged 42 years.alfo James Pillions her hufband he died Jan r 12th 1798 aged 28 yearsAnd Jannet Gass daughter to above Francis Gass who died 7th Janr. 1806 aged 23 years. 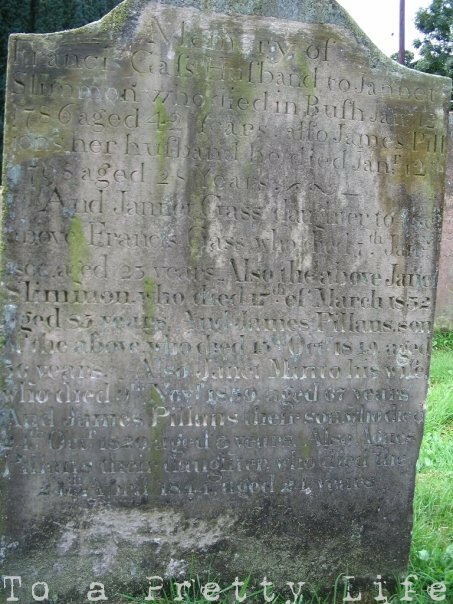 Also the above Janet Slimmon who died 17th of March 1832 aged 85 years. And James Pillans, son of the above, who died 15th Octr. 1849 aged 56 years. Also Janet Minto his wife, who died 9th Novr. 1859, aged 67 years. And James Pillans their son who died 14th Octr. 1820, aged 3 years. Also Agnes Pillans their daughter, who died the 24th April 1844, aged 24 years. 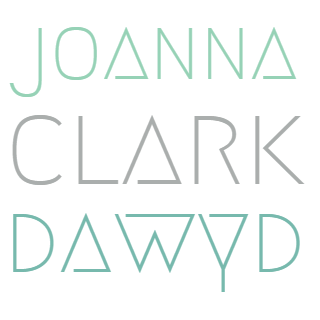 Wow - beautiful, Joanna. So much meaning behind this picture! Neat that your relatives found you online! That's really cool, Jo. Last year I went back to my family hometown in England - it was really neat to see the family church where my parents were married and I was christened. So important to know where you came from. Sadly not all of us can do that. That's very cool... but slightly confusing! I'm having a hard time figuring out who belongs to whom. Whose husband was James Pillions? No kidding, Salyan! From what I can tell, Francis Gass and Janet Slimmon were married and had two kids, Janet and Francis. Then Francis Sr. died and Janet married James Pillions. They had a son, James Pillans, who married Janet Minto. This second James had two children buried here: James and Agnes. I'm related to the Pillans family. My great great grandmother was Laura Jane Pillans. That's awesome!!! I love history and ancestry too. I've even spent a lot of time researching my husbands family, as they have really interesting history that traces back to where I am from as well. We have discovered that we are 8th cousins once removed! I want to be able to pass the information I have collected on to our children. Wonderful to see such old family history. I too am fond of my family history and certainly enjoy going to the family cemetery here in rural Georgia and being able to see the graves of 4 generations on my fathers side. My mother's family, 3 generations back is buried in the next county over. My children don't quite "get it" and they certainly are old enough, early 20's. Maybe one day they too will appreciate their family heritage. At least they know where to look, as I've forced them to go with me many a day!! Fun post, I really enjoyed it!